32 years ago tonight (1983) Based on the way the Edmonton Oilers were talking before the series, it was probably not a surprise to them the Stanley Cup Final ended in a sweep. 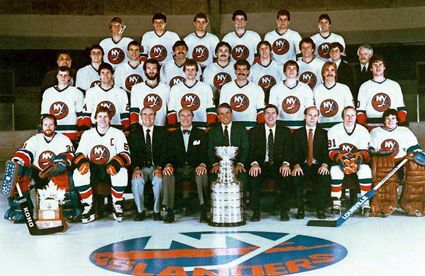 Of course, they were on the short end of it – as the Islanders defeated Edmonton 4-2 to claim their fourth consecutive Stanley Cup. The game was nearly decided in a span of 1:37 of the first period, as Bryan Trottier, John Tonelli and Mike Bossy all scored to give the Islanders a 3-0 lead. To their credit, Edmonton fought back in the second period on goals by Lee Fogolin and Mark Messier to cut the Islanders’ lead to 3-2. However, with Billy Smith enroute to the Conn Smythe Trophy, the Oilers could not find the tying goal. With 1:09 left to play, Ken Morrow hit the empty net to assure the victory, and the Islanders’ fourth straight Stanley Cup. The high-powered Oilers managed only 7 shots in the third period in part because they spent over 5 minutes shorthanded. The last 3:10 that they were shorthanded came when Glenn Anderson was assessed a major penalty for slashing Billy Smith, enraging Oiler coach Glen Sather, “He’ll probably be up for an Oscar for that. Well, at least he’s starring Off-Broadway”. Smith admitted after the game that he had, well let’s just say, embellished, the call. “I was hurt about as bad as Gretzky was (in game 2, when Smith slashed him), but (Andy) Van Hellomend wasn’t going to call a penalty until I laid down and started squirming. I’m sorry I had to do it. I hated doing it- it’s not my style to do it. But people are giving me cheap shots all the time.” Smith’s comments appeared in a Newsday story by Helene Elliott. Here's the Stanley Cup film. The "Core of the Four" were honored in 2008 at the Coliseum. Here's the coverage from Fox Sports NY. Also on this date: (1980) – The Islanders scored 5 power play goals (3 in the first period) and cruised to a 6-2 win over the Flyers in the first Stanley Cup Final game ever played at the Coliseum. Denis Potvin scored twice and added two assists – all on the power play. The win gave the Isles a 2-game-to-1 lead in the series. 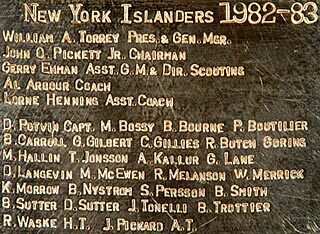 The Isles would go on to score 15 power play goals in the series, most ever by a team in the Stanley Cup Final. Also on this date: (1981) in Bloomington, Minnesota, Butch Goring scored three times as the Isles rallied from 2-0 and 3-1 deficits to defeat the North Stars 7-5 and take a 3-0 lead in the series. Mike Bossy scored twice, giving him 17 goals on the spring as he became only the 2nd player in NHL history to score at least 17 goals in a playoff year – Minnesota’s Steve Payne would join the 17-goal club two nights later. All-time, the Isles played two playoff games on May 17th at the Coliseum; they compiled a 2-0 playoff record on this date at 1255 Hempstead Turnpike in Uniondale.